Another Cartoonist Parlour Game I forgot to mention in my earlier post on the subject is Character Battling. In this, two or more cartoonists create characters, and then they take turns drawing comics with the characters. Usually fighting. I don’t know what the history of this one would be… it is probably an instinctual activity of young cartoonists to collaborate with comics where each cartoonist draws their own character and they have them interact. 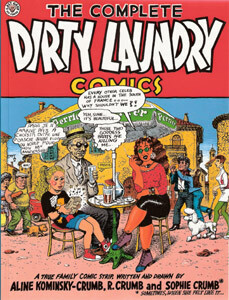 In published comics, a notable example would be Robert and Aline Crumb’s ongoing semi-autobiographical Dirty Laundry Comics (previously to these, Bob Crumb had done a lot this activity with his brother Charles, as well). Recently, the cartooning innovators at Big Time Attic have been doing comics in this fashion where they are very battle focused. 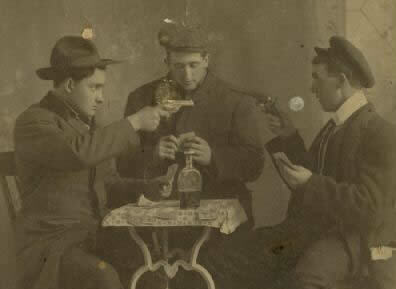 Their innovation in this case is to have the conclusion of the battle determined by a coin-flip, rock-paper-scissors, or some other semi-random determining game (they go as far as to videotape the determining event and put it on you-tube, so you can experience the tension first hand). Here is the most recent example. Above: Tim Sievert and Brett VonSchlosser work on collating mini-comics into Lutefisk Sushi Volume B boxes in a photo by Shad Petosky from the Big Time Attic blog. In my post on Cartoonist Parlour Games yesterday, Tim Maloney commented that the collaborative mini-comics box set is another cartoonist parlour game (he recently was involved in making the The Bog Box Golden Treasury of Minicomics, which looks quite wonderful). I hadn’t been thinking about box sets in those terms previously, but it definitely makes sense. We’ve had great success with mini-comic box sets in the Minneapolis cell of the Cartoonist Conspiracy, so I thought I’d talk a bit about how to organize your own box sets (maybe this will turn into notes for another volume of the Cartoonist Conspiracy Li’l Library eventually). We’ve produced four box sets in Minneapolis. Two were collections of mini-comics by Minnesota cartoonists called Lutefisk Sushi Volume A (circa 2004, numbered edition of 100) and Volume B (circa 2006, numbered edition of 150). These were tied into some spectacular gallery shows of the same at Creative Electric Studios. We also used box sets to collect mini-comics from the last two 24 Hour Comic events we had in Minneapolis in 2005 and 2006 (in 2004 we collected 24 hour comics from our event as a book, which is a considerably more complex and expensive thing to pull off). It is very economical. As opposed to printing an anthology, you only need to supply a box rather than paying for an entire print job. Contributors can print their own books to put in the box. Again, unlike a book anthology, a box can hold a wide variety of formats. In our boxes, we’ve had all kinds of sizes and shapes… one that was in a plastic bag with glitter, one that included a magnifying glass, and one that was a scroll hand-silkscreened in invisible ink. Obviously, you can’t do this with a book. The anthology format of most box sets makes it so people can try work by a wide variety of artists, which is a great way to turn people on to a lot of exciting work. It’s a fantastic way to collect the work of cartoonists from a 24 hour comic event… if event hosts organize a box set in conjunction with their event, they can really step the whole thing up a notch. If you’ve produced a lot of mini-comics on your own, packaging them as a box set can help you sell more of them to package a bunch of them together at a lower price than the cover price of the individual minis. They can be amazing for fund-raisers. With our two Lutefisk Sushi shows the Minneapolis Cartoonist Conspiracy made around $2000 that we sent to the Comic Book Legal Defense Fund. With Volume B the money we donated we gave in the form of memberships to the CBLDF for participants in the box set. The major limitation of the box set collection is that it would be very difficult to pull off without a pretty limited print run. These are all put together by hand, and it gets harder to pull off the more of them that you make. 100 seems to be the sweet spot, but we did 150 for the Lutefisk Sushi Volume B show. If people are contributing comics to your box set, you want to keep their print runs affordable too, and printing mini-comics can get expensive (and time consuming if they are elaborate mini-comics, of course). 100 copies won’t break most people’s banks. Obviously, for the same reasons, you can’t really go back to press on one of these sets generally. However, the limited print runs and hand-made factor also make these very collectible objects. Number them like you would with a limited edition print to emphasize the limited nature. Unless you are planning a collection of your own work, you’ll want a lot of people to work with on this project. With box set anthologies, “the more the merrier” is definitely true. Additional collaborators add MUCH more to the value of the box than the negligible costs involved by including them. Besides your cartoonist friends, the internet is definitely the best way to find cartoonists to participate. I like to think that The International Cartoonist Conspiracy website is the best place to look. The Cartoonist Conspiracy is open to all cartoonists, and includes professional and amateur cartoonists in its ranks… anyone with any interest in making comics can join. Additionally, anyone can start a cell in their community… contact me if you want to start one and I’ll get you set up (I’m the Cartoonist Conspiracy webmaster). You can organize your group utilizing our message board. We currently have cells in Minneapolis MN, San Francisco CA, Calgary/Edmonton, Chicago IL, Lancaster PA, Milwaukee WI, Montreal, Rice MN, Sacramento CA, Sioux Falls SD, Springfield IL, Kansas City MO, Santa Fe/Albuquerque NM, and North Carolina. If you don’t want to go through us, there are plenty of other places to find collaborators as well… posting on the Comics Journal message board will also probably get you some good results. Do you want to organize it around a gallery show? How many copies do you want to make? How are you going to put the boxes together and print them? How will you promote and distribute them? How many copies will collaborators get? How many boxes do you want to make? If you make a profit, what will you do with the money? You may want to consider organizing this for a charity. You’ll want to discuss these and other logistics with your collaborators before getting started. If you have a theme, let people know it. Are there any format guidelines or restrictions they should know about. Do you want people to sign their mini-comics? Give people a size limit… so far we’ve used boxes that will fit comics up to 5.5″x8″, but you may want to go for a smaller or bigger box. How many copies do they need to contribute? How many copies of the box set will they get for participating? Will you want their help with collating, printing, or anything else? You should! Let them know. Make a hard deadline date. I recommend making this date earlier than you actually need it. That way, when people email you enmasse the day of the deadline asking for more time, as they inevitably will, you can afford to give them an extension to secondary deadline. If you recruit people who have never before made a comic in their life (which I also recommend pursuing… every artist should try their hands at a mini-comic), refer them to this online “How To Make Mini-Comics” mini-comic. There are probably any number of places online to get boxes. We’ve used this site… note that they have some sweet spots in some of their pricing on certain types of boxes and quantities that you may want to look for if you use them. Other than for the first Sushi show, we used this box. Here are a couple other good, inexpensive ones. We’ve used two methods for covering the boxes. For the Lutefisk Sushi shows we silkscreened wraparound covers, for the 24 hour boxes we printed stickers that we adhered on the covers. You could do a number of other things as well. A printed band around the box could look really cool, you could draw the covers by hand with crayon, you could use a rubber stamp… if you have a gocco machine, that would work great (unfortunately these wonderful devices are no longer being manufactured, although you can still find some supplies for them at Wet Paint Art). The sky is the limit. 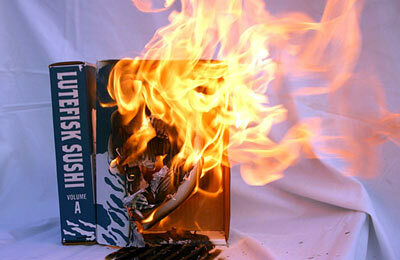 You can see a video of Lutefisk Sushi Volume B boxes being hand silkscreened by Lonny Unitus and Shad Petosky here. Fold all the boxes into box form. Put all of your mini-comics in stacks by comic around a big table or two. 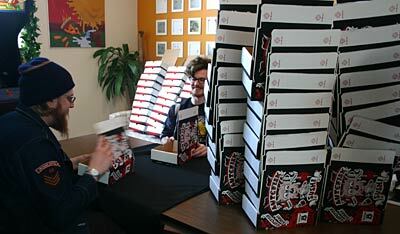 Have people grab a box, and walk around the tables putting one of each comic into the box, one comic at a time. Take it slow, you REALLY don’t want to have to do this twice. When all the comics are in a box, close the box and add it to the box pile. Every participant should get at least one box, depending on the number of participants and the print run. Beyond that, the best way to sell them, in my view, is in conjunction with a gallery show featuring work from the box on walls. Putting together a comics gallery show is a whole separate beast that I’ll probably post another how-to about sooner or later. Besides the coolness of the finished mini-comics box, this project is a really great way to get to know cartoonists in your area and build relationships for fruitful collaborations. Good luck! Have you ever made a mini-comics box? Are you planning to make one? Let us hear about your experiences in the comments! 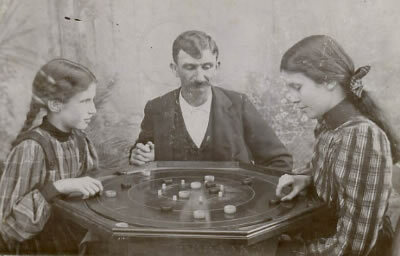 In recent years the number of Cartoonist Parlour Games (i.e. drawing projects & challenges with guidelines) has been exploding. And I’m not even counting Pictionary. I thought I’d provide an overview of the ones I’ve heard of or participated in (I’m the webmaster and one of the founding members of The International Cartoonist Conspiracy). Some of these games, particularly the extended jam and the 24 hour comic I feel I’ve learned a whole lot from as a cartoonist… I highly recommend trying some of these games out if you have any desire at all to draw comics. It will make you a better cartoonist. Started in the late 60’s by the Zap cartoonists. One cartoonist draws a panel or space on a page, another cartoonist continues, and then another until it’s done. Note that you can see a lot more examples of jams and many of the other parlour games (many very NSFW) here. Conspirator Zander Cannon of Big Time Attic recently wrote an excellent summary of how to have a successful comics jam here, and there is good general summary of comic jamming by The Monthly Montreal Comix Jam here. 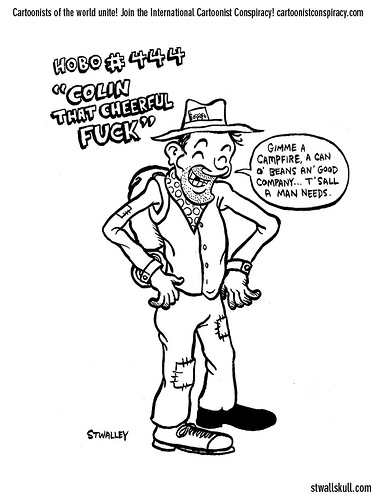 Here is a jam comic example from the Minneapolis cell of the Cartoonist Conspiracy. A variation of the traditional jam comic that we’ve been pioneering in the Minneapolis Cell of the Cartoonist Conspiracy. Rather than doing one page of randomness, we usually do 16 in an evening (a nice convenient number for reprinting as a mini-comic). We number all the pages at the outset. Everyone takes a random page. When you get to the end of a page, you look at the first panel of the next page and try to thematically tie your panel into the previous panel and the next panel. To help make things slightly cohesive, we choose 2 or 3 themes at the outset… for a while we were picking from a bag full of suggested themes, but lately we’ve just been choosing themes from a random page of a magazine or just having people suggest what they want to draw. One other thing we have tried (which I want to try more) is having a character or two designed at the outset that can run through the comic (some structure to jam comics seems to make them a lot more fun to read later). Zander Cannon also discusses how to make a successful extended jam in his previously mentioned post. Here’s an extended jam example from the Minneapolis cell of the Cartoonist Conspiracy. 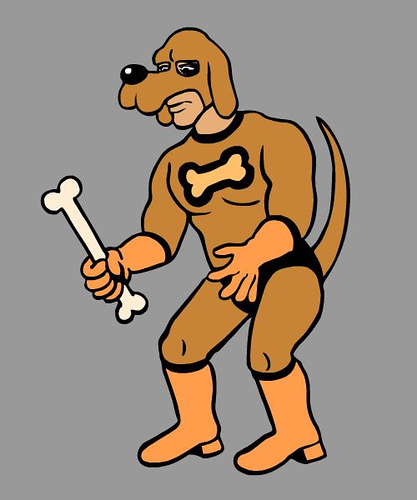 This was created by the Iowa City Phooey cartoonist collective in the 1980’s, which I went to some meetings of when I was a kid. They had a roll of paper like register tape attached to a wooden device where you would draw a panel and then roll it forward for the next cartoonist to continue. At the end you could just attach another strip, if you were inclined. I don’t have an example of this one, unfortunately. The Narrative Corpse is another variation on the jam comic. This one was popularized by Art Spiegelman, who did a widely distributed narrative corpse with 69 other artists. The concept is based on the “exquisite corpse” game of the surrealists. A cartoonist draws a panel based only on knowledge of what occurred in the previous panel… and then passes their panel on to the next cartoonist. I have no examples of this, but there was one recently organized by Aeron Alfrey on this site, which I believe is going to be published sometime soon. Jam War is a project pioneered by Nat Gertler (who also founded 24 Hour Comics Day). It was a collaborative comics competition where groups of creators were given a theme, and 12 hours to draw 8 pages. Basically, this is not different than a conventional comics jam, except it is competitive… the resulting work is judged for which one is best, so there is a winner. The Minneapolis and Rice, MN Cartoonist Conspiracy cells participated in this, but the results have thus far only been published as a minicomic called “Mission Accomplished” which is not online, so I have no example of a Jam War to share, unfortunately. This one was introduced to our cell by conspirator Andrey Feldysteyn, and he wrote up a summary of it here. He had done it previously with his cartoonist friends in Russia, where he hails from. Someone chooses a random topic, and the participating cartoonists draw as many gag cartoons on that topic as they can in 10 minutes. At the end of the 10 minutes, the cartoonists pass the cartoons around for voting… judges (which can include participants) mark on the back of the drawings. They write nothing if they don’t think it works, 1 cross if they like it, 2 crosses if they love it. The cartoonist with the most points wins. Gambling and drinking should be involved. Each cartoonist draws 24 pages in 24 hours… extreme sports for cartoonists. This wonderful exercise was conceived by Scott McCloud (author of Understanding Comics and Making Comics among other things). You can find the rules aka The Dare here. 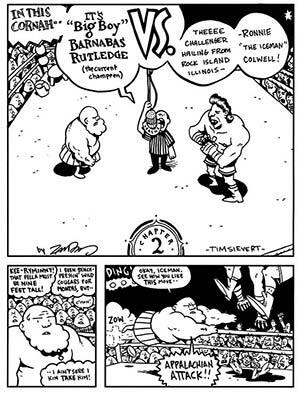 Nat Gertler took the challenge and made it into a national holiday for cartoonists… 24 Hour Comics Day. As far as I know Nat hasn’t announced the date for this year’s 24 Hour Comics Day, but you can subscribe to the 24 Hour Comics Day blog to stay posted on it. Here is an example of a 24 hour comic I made. This is a new project being pioneered by the Cartoonist Conspiracy. These are both variations on McCloud’s 24 Hour Comic. In the 288 hour comic, you draw 24 pages in 24 hours once every month for a year, and end up with a 288 page graphic novel at the end of the year. In a Gross comic, you draw 12 pages in 12 hours once every month for a year, and end up with a 144 page graphic novel at the end of the year (144 makes a gross… corny, I know, but catchy!). Beyond that, though, the goals of these projects are completely different. These are intended as motivational tools for producing good comics, rather than just an exercise in making comics quickly (as with the 24 hour comic). To that end, “cheating” is encouraged. You may work ALL YOU WANT on any part of the project outside of the defined time… however, at the end of the defined 12 or 24 hours every month you should have your 12 or 24 pages done, or you should work like heck to get them finished up as quickly as possible after that. If you reach the next month and have not finished your pages from the previous month, you have failed. We started the Gross Comics Project last weekend, and we’re looking for hearty cartoonists from around the globe to join us in this project… we’ll post links to all participants on the cartoonist conspiracy blog. You can see examples of Gross Projects in progress here. You can see the only example of the 288 Hour Comic in progress here… Kevin Cannon is a cartooning madman. Another Scott McCloud invention. Cut out some Ernie Bushmiller Nancy comic strip panels to make a deck of cards, and then get a group of people together to play. Deal out the panels and take turns placing them next to each other to continue the story. Read the rules here to learn how to play here. You can play a solitaire version of 5-Card Nancy online here. This is a game I invented where you create nine panels that can be randomly shuffled and read in any order for different effects. It was originally intended to be viewed in an open source flash movie that I built, although you could just do it on cards and rearrange them by hand… you can see it in action here. Clicking the shuffle button rearranges the panels. You can download the source here if you want to make a online version. Please let me know if you do so I can link to it. We haven’t tried this one in Minneapolis but our comrades in the San Francisco cell of the Cartoonist Conspiracy really enjoyed it. 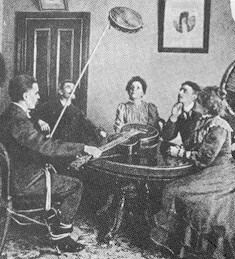 Shuffleupagus is a jam technique invented by Jesse Reklaw. It involves having participating artists draw a character and a setting on blank index cards… and, well, the rules are a little convoluted to explain after that (although they look like fun)… read more about it here. I just heard about this the other day, and I think I’ll probably give it a try at some point soon. The 22 Panels That Always Work Project is pretty simple… just look at the famous Wally Wood 22 Panels That Always Work comic, and draw your own version of it. 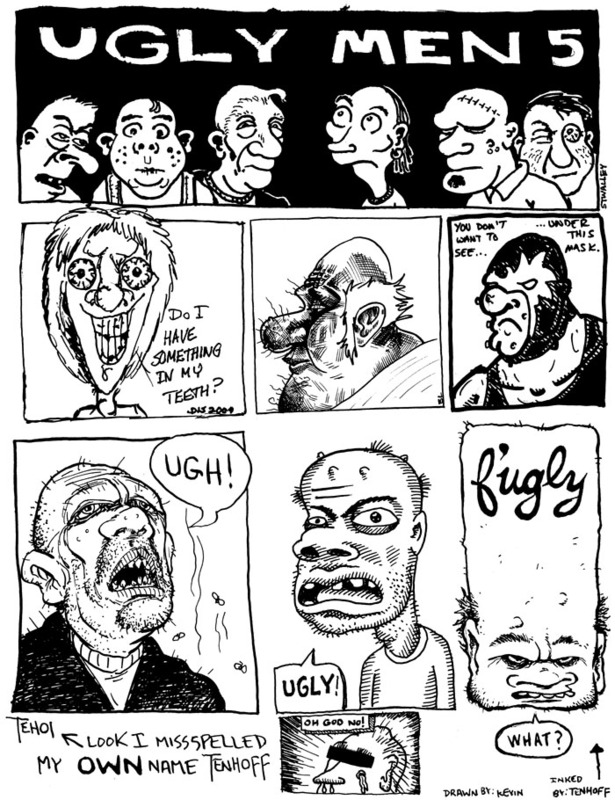 After that you may want to draw your own version of Ivan Brunetti’s 22 Panels That Always Work too! 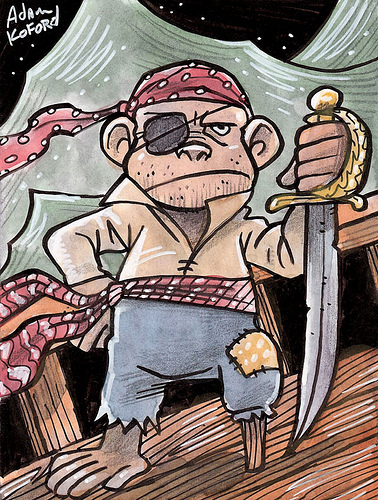 I’m going to start introducing a new cartoonist parlour game every month or so on this blog, so check back to participate and/or enjoy the results! Have you heard about other Cartoonist Parlour Games? If so, please let us hear about them in the comments!